beginnerswork.com - SWIMMY- many hands make meaningful art. 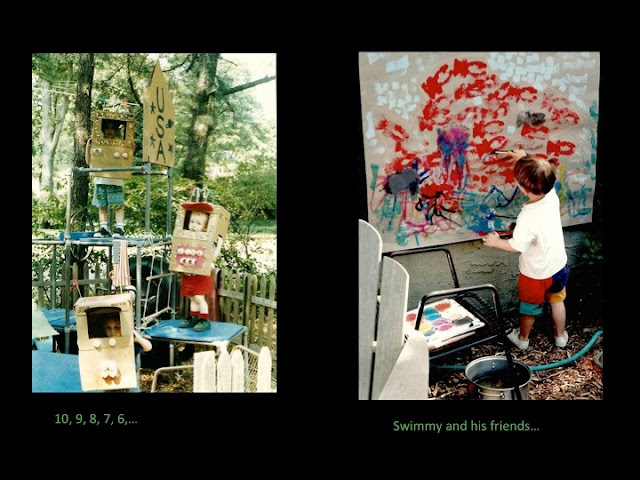 SWIMMY- many hands make meaningful art. 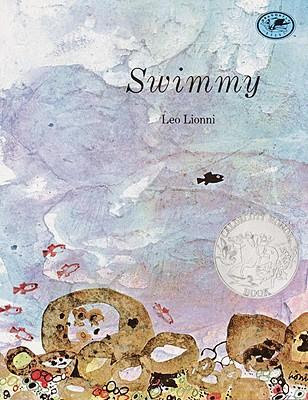 I love Leo Lionni's story about a little fish who is lost at first, but who eventually grows into a leader... 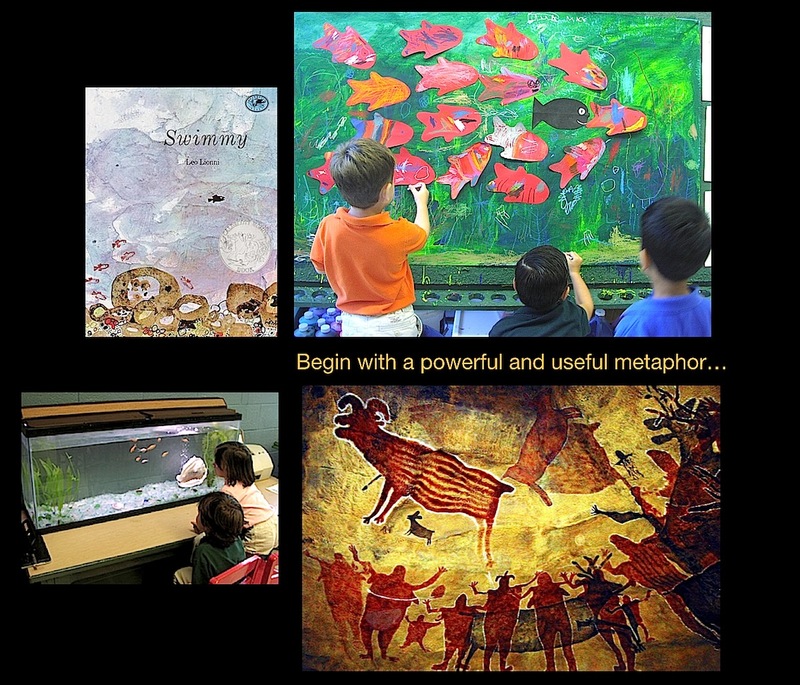 Some books are both beautiful and useful to teachers. They are classics because of their universal meaning and should be part of every elementary classroom library. Swimmy is a perfect classroom story and a lesson about cooperation and leadership. When I got my own Pre-K classroom, I decided that a Swimmy mural would be a good first project. I wanted to create a sense of unity and cooperation in the class. We were a Pre-K class in an independent elementary school, so we pretended that the big kids were big fish as we walked together along the busy halls to the library or gym. Each day we chose a line leader and she was called the Swimmy for that day. This method worked well all year. Below a few beginners take their turn creating the sea, by mixing yellow and blue poster paint directly on the mural paper. They are making an environment for their little fish. In general, I recommend using real poster paint, not washable paint. The washable colors are thin and the red has too much orange to mix accurately. Of course, it's impossible for anyone to paint and stay neat. Smocks are helpful, especially these plastic ones, after I have cut about six inches off the sleeves, and rolled up the beginners' shirt sleeves underneath. 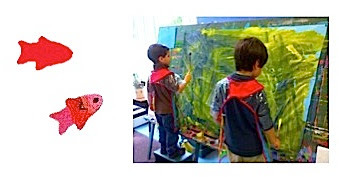 Each child contributes one smock to a mutual supply, so there is less fighting over whose smock is whose. 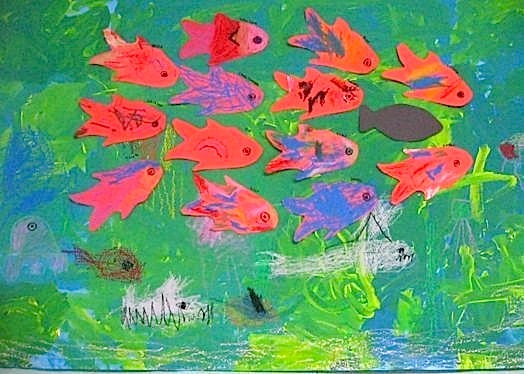 At the same time, the rest of the class is working at the table, each decorating a pre-cut construction paper fish with bright Craypas. For this project, I removed brown and gray from the color choices to maintain the lively color scheme. When the paint is dry, each red fish and one black fish are pasted swimming in the same direction, to form one big fish. 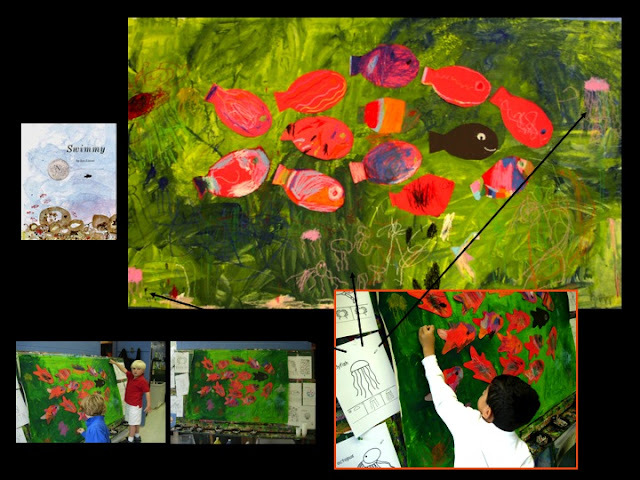 At this stage you might notice one or two little fish who want to swim in the opposite direction; this mural is for them, because the idea ofthis mural is individuals who cooperate. 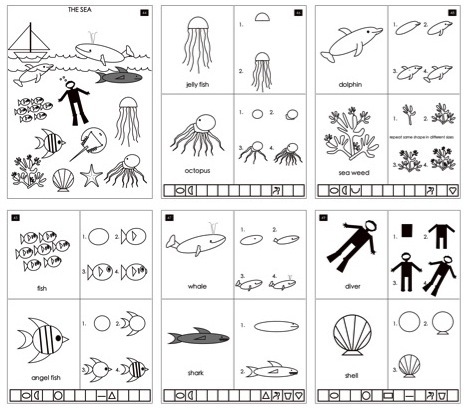 For the last layer, each child uses Craypas to draw a sea creature that they think their fish will meet. These drawing lessons are from DRAW! a book I have created so that kids and teachers could learn to draw in the classroom, while they learn to write. Copy these pages and pin them in sight of your artists for reference. This is the class' first attempt at figurative drawing, so I am expecting the basic idea of a jelly fish (the easiest.) Some beginners may need to practice, with your help, on a seperate piece of paper. This activity is not only a great social lesson, but it introduces drawing and painting cooperatively and the magic of mixing colors. And the result is spectacular! 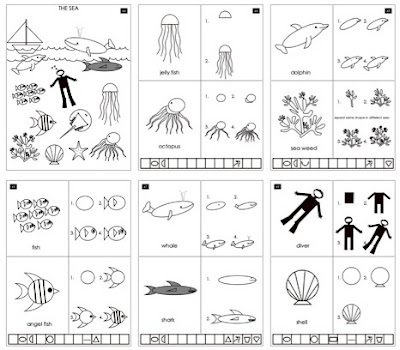 There are some useful methods used in this activity. We created a layered piece of art that takes a few days to complete. Children learn to delay gratification by working carefully in stages. This layering allows my beginners to produce a more complex project that evokes an amazed and enthusiastic response from anyone who sees it, reinforcing all that work and cooperation with applause and recognition. Parents love it, it combines individual expression and cooperation. It is a perfect teaching metaphor.